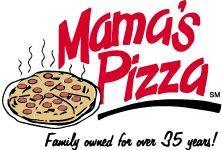 Mama’s Pizza has been serving Omaha pizza Since 1975 and has been operated by the Harwood Family for over 35 years. At Mama’s, we are known for our homemade pizzas, which are made with the freshest of ingredients and are prepared daily in each of our kitchens. To ensure quality, we make our pizza dough in-house every day, and sometimes each location in Omaha and La Vista can go through over 500 lbs a day! Here at Mama’s, we also cook ground beef daily, which is one of our most popular pizza toppings. Each of the three stores cooks over 1000 lbs a week, 30 lbs at a time! We recommend trying our Mama’s Classic Beef Pizza, which comes loaded with freshly cooked beef and our hand sliced mozzarella cheese. It’s an Omaha favorite! In addition to Omaha pizza, Mama’s has a full menu which includes delicious hand breaded onion rings and pickles, as well as homemade cheese logs. Some of our sandwich choices include the pork tenderloin and meatball sub sandwich, which are customer favorites. A few of our dinner options include spaghetti with a homemade marinara, freshly breaded chicken fried chicken and a very popular hot beef sandwich. No matter what you decide to order, be sure to get at least one side of our famous house dressing! This creamy garlic dressing is the perfect match with all of our tasty pizzas, appetizers and salads. Mama’s also offers bottled beer, draft beer and if you like margaritas, be sure to try ours, it’s very popular! Whether you are dining in with us or taking your food to go, we thank you so much for giving us the opportunity to serve you! After a successful run in the early 70’s the owners of The Big Tramp (Greg Kean, Johnny and Jimmy Howell) decided a change was necessary. They moved the kitchen to the south side and started making pizzas. The name Mama’s Pizza and the recipes were inspired by two friends of the business Lou Pantano and Yano Falcone. Around 1977, Mama’s tried opening a second location in Lake Manawa, Iowa. The run was short lived as the area was not yet developed enough to support the business. In September, 1980, Jack and Rose Harwood purchased Mama’s Pizza. At the time, it was struggling. Originally, they had planned to change the name. When they found out how much it cost to change the name, they decided, Mama’s was a pretty good name. Jack and Rose operated it for 20 years. They took a struggling bar and transformed it into one of Omaha’s favorite family pizza joints. On January 1st, 2000 Jack and Rose sold the business to Jack’s children. The goal was to simply continue the traditions established by Jack and Rose. In 2007, Mama’s added a second location in West Omaha on 156th and Pacific. A third location was added in 2013 in La Vista. And coming soon, Mama’s will add a satellite location inside of the Mutual of Omaha Building.